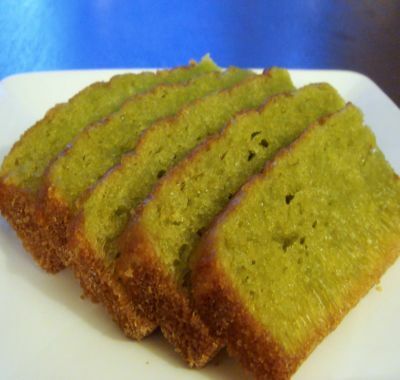 Pandan Cake is a light, fluffy cake of Malay origins (Indonesia, Malaysia, The Philippines) flavored with the juice of Pandan (Pandanus amaryllifolius) leaves. I've always been fascinated by their beauty! These cakes are light green in color due to the chlorophyll present in the leaf juice. But most of the times, additional green food coloring is used to further enhance its colour. Right from the time I tasted one at an Asian Cafe, I've been wanting to try these at home. Luckily, I found some Pandan Extract in my grocery store and I could finally make this chiffon cake, where I paired Coconut with Pandan! This may not be the best flavor for cakes in the world, but these Coconut Pandan Cake slices are definitely unique, looks pretty, and is should be tried at least once! I used a recipe given by Anna, my colleague's wife, and I did trouble her a lot with phone calls as I was really apprehensive about how these would turn out! She was pretty patient with me, and I'd like to thank her for all her help and tips! I did end up adding a teeny-bit more green food color, hence the darker shade. Also, maybe the Pandan extract is not as good as the Pandan juice, hence I got a little "stretchy" texture in the bottom part of my cake. But otherwise, this was a successful experiment, which tasted great! Preheat oven to 375F. Line a bread-baking tray, or a cake pan with a wax paper and set aside. In a bowl, lightly beat the eggs, add water, coconut cream, oil, pandan extract, salt, sugar, baking powder & baking soda and mix well. Sieve the flour, and slowly pour into the mixture, mix well, and set aside. Pour the mixture into the prepared bread or cake tin. Bake for 20 to 25 minutes or until a light brown crust appears on the top, and the tooth-pick test is satisfied. I particularly loved the flavor of coconut with pandan; by itself, it may not have been as tasty, but the coconut cream made this a winning recipe! After a lot of hype and hooplah, I was happy at how this cake turned out. Thanks Anna, for a beautiful Coconut Pandan Cake recipe! A green cake! How creative and beautiful. Where am I going to find the Pandan extract! Sigh! I love Pandan. I have been expermenting with it a lot. Aklways paired with coconut. The flavor is always indescribable to me.Almost almondy maybe. pandan cake looks very nice and inviting, a new recipe. thanks for sharing. Really tempted by the cake snaps! An interesting green cake! Haven't heard of the pandan extract.. hmm, will check in the stores next time..
Thats truly innovative mansi..would love to try it but the Pandan extract seems hard to get here. Could you suggest a substitute? hey people! thanks for visiting while I'm away - you guys simply rock!! Hi, Have a surprise for u in my blog, do visit! Thanks for the link and info on Pandan extract...will try this cake. Preheat oven to 350F. Line a bread-baking tray, or a cake pan with a wax paper and set aside. In a bowl, lightly beat the eggs, add water, yogurt, oil, pandan extract, salt, sugar, coconut flakes, baking powder & baking soda and mix well. Mix together until smooth, spread on still-warm cake.